Update: Speaking to Polygon, Wolpaw confirmed that he is working with Valve, though not as a full-time employee. He is working as a contractor and, he joked, an unpaid intern playing Slay the Spire three hours a day. "I’ve been helping Pinkerton and Jaros and Vanaman whenever they need it," he told Polygon. "It’s been busier on that front lately, but I’m not currently a full time employee." Original Story: It looks like ex-Valve writer Erik Wolpaw can drop the ‘ex’ prefix. 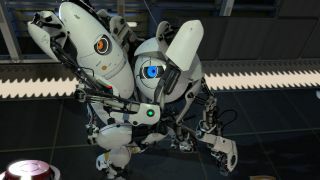 Wolpaw worked on both Half-Life episodes and Portal 2 before leaving the developer in 2017, but after a stint at his old employer, Double Fine, he appears to have returned to Valve. Wolpaw’s name was spotted in the Artifact credits by Reddit user Trenchman, who then reached out to Gabe Newell directly and, surprisingly, got a response. According to the email from Newell, Wolpaw is indeed back at Valve, though his name doesn’t appear on the Valve staff list. 2017 saw a writer exodus from Valve, with Chet Faliszek and Jay Pinkerton both leaving soon after Wolpaw. Faliszek moved to Bossa Studios, but Pinkerton rejoined Valve a year later. Half-Life and Half-Life 2 writer Marc Laidlaw also left the developer the previous year. When they left, Valve seemed to have all but given up on the story-driven, singleplayer games that they had previously written, the last one being Portal 2, but despite some of them seemingly returning, Valve is still very much submerged in competitive multiplayer games like Dota 2 and Artifact. New singleplayer or story-driven games could be on the docket, though. "Artifact is the first of several games that are going to be coming from us,” Newell said last year. “So that's sort of good news. Hooray! Valve's going to start shipping games again." Valve acquired Firewatch developer Campo Santo last year, and the team continues to work on Valley of the Gods, but Valve's other projects remain a mystery for now.